The Meade LX90 is the first full-capability, computer-controlled 8" Schmidt-Cassegrain ever offered in its price range. The LX90 Schmidt-Cassegrain is not only a high-resolution visual observing instrument but also is fully qualified for the more advanced areas of astronomy, including long-exposure CCD-imaging and astrophotography.  A chromed-steel variable-height tripod that provides all the rigidity required in sensitive field applications - in fact, the same tripod as provided with the Meade 8" LX200GPS. 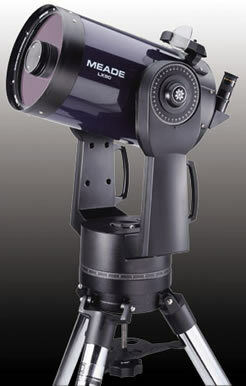 Meade's new LX90 automatically levels your telescope, determines North and sets the time. You just enter your location or zip code. After your LX90 completes its patented Level North automatic alignment procedure it will point to the first alignment star. Use the new wide-field SmartFinder to center the red dot over the alignment stars for ultra-precise pointing accuracy. It’s that easy. Optional Ultra-High Transmission Coatings (UHTC): Meade UHTC coatings increase total telescope light transmission, averaged over the visible spectrum, by about 15% for greatly enhanced photo-visual image brightness. If desired, the UHTC must be specified at the time of telescope purchase. Cordless Operation: The LX90 is powered at 12 volts DC from (user-supplied) C-cell batteries loaded through the upper surface of the telescope's drive base. The telescope may also be powered from an automobile cigarette lighter plug or from standard 115vAC home outlets, using optionally available power cords. Equatorial Wedge: The optional 8" equatorial wedge is required for long-exposure astrophotography and permits precise polar alignment of the LX90 in the equatorial mode. For short exposure images (less than about 5-minutes) the wedge is not required. #909 Accessory Port Module (APM): The optional #909 APM attaches to the rear-cell of the LX90 and connects by cable to the AUX port on the telescope's control panel. The APM includes auxiliary connectors for plug-in of such accessories as corded models of illuminated reticle eyepieces, the #1206 Electric Focuser, or a CCD autoguider. Automatic GO TO capability at 6.5°/sec on both axes, simultaneously, to 30,223 database objects. Automatic GO TO capability to any object of known RA and Declination. Nine selectable slew speeds: 6.5°/sec, 3°/sec, and 1.5°/sec, plus 128x, 64x, 16x, 8x, 2x, and 1x sidereal.